Tour 2017 offers the last chance to see one of Glyndebourne’s favourite productions, Mozart’s Così fan tutte, as staged by Nicholas Hytner. Set in 18th century Naples and sung in Italian, Così fan tutte was first performed in 1790. It is the third in a trilogy of comedies (following Le nozze di Figaro and Don Giovanni) by Mozart and librettist Lorenzo Da Ponte. The title, Così fan tutte does not translate comfortably into English, although ‘women are like that’ is usually adopted. But these misogynistic words, coming from one of the opera’s least sympathetic characters should not be taken as a reflection of Mozart and da Ponte’s opinions of women. 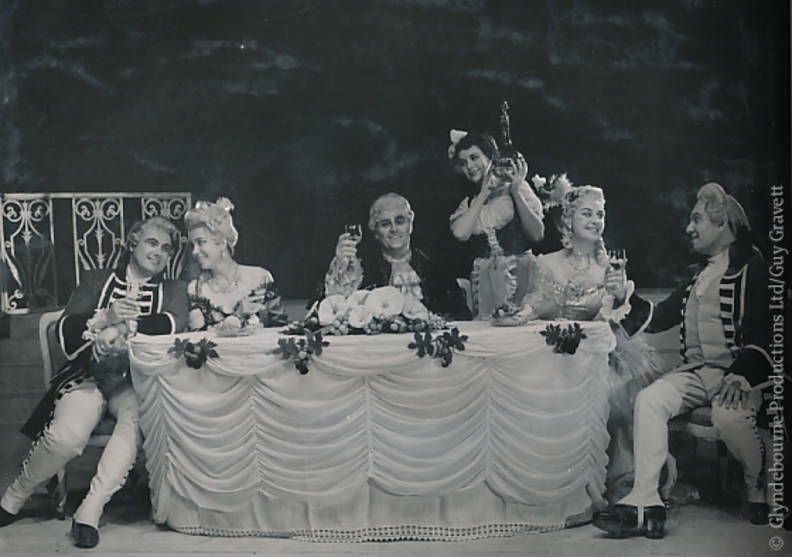 A comedy of sexual manipulation, Così fan tutte was deemed to be obscene, immoral and vulgar by 19th century moralists who were shocked by the portrayal of well-bred women. But more recently, critics have deemed it to be subtly nuanced. Indeed, the opera’s subtitle La scuola degli amanti or ‘school for lovers’ refers to the unmasking of pretence and the lessons of the heart learnt by the four young protagonists. Listen out for the gorgeous trio for Don Alfonso, Dorabella and Fiordiligi ‘Soave sia il vento’ that they sing as Ferrando and Guglielmo go off to ‘war’. The story begins with philosopher, Don Alfonso, betting two young men, Ferrando and Gugliemo, that their fiancées Fiordiligi and Dorabella will not stay faithful if put to the test. 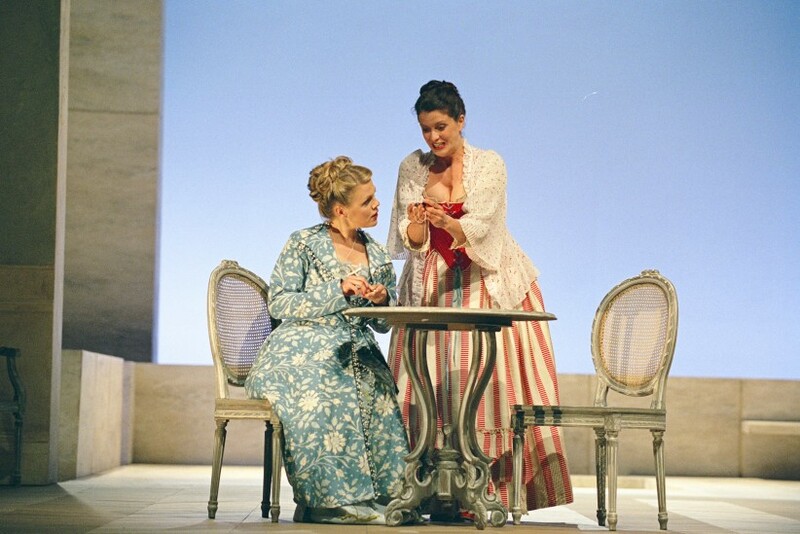 Fiordiligi and Dorabella in the Festival 2010 production of Così fan tutte. Photo: Mike Hoban. Ferrando and Guglielmo accept Alfonso’s wager and pretend to their lovers that they have been called off to war. They return in disguise and successfully seduce the other’s fiancée. Despite having won his bet, Alfonso urges the men to forgive their fiancées’ indiscretion and a double wedding goes ahead, with the original couples reunited. Audiences will enjoy moments of laughter and reflection on the nature of relationships and betrayal. 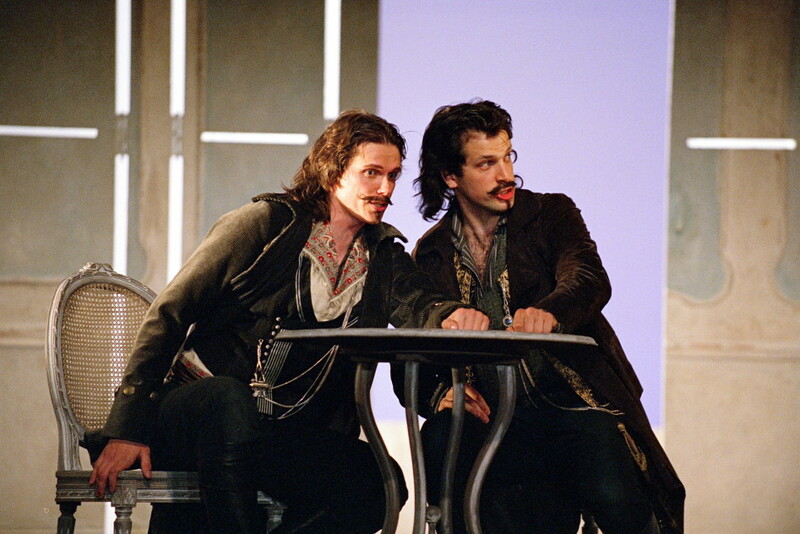 Ferrando and Gugliemo in the Festival 2010 production of Così fan tutte. Photo: Mike Hoban. 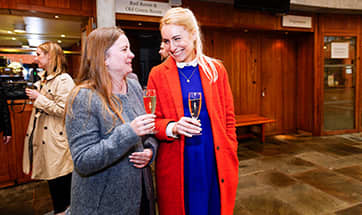 This glorious period production by Nicholas Hytner has been described as an evening of ‘Mozartian magic.’ by the Sunday Times and an evening of ‘passion and compassion’ by the Daily Mail. 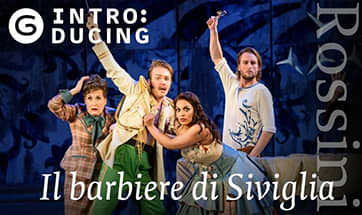 Writing about the staging and designs, The Stage described it as ‘visually elegant’ and the Sunday Telegraph wrote that ‘This Così offers not only lessons in love but lessons in Mozart’. 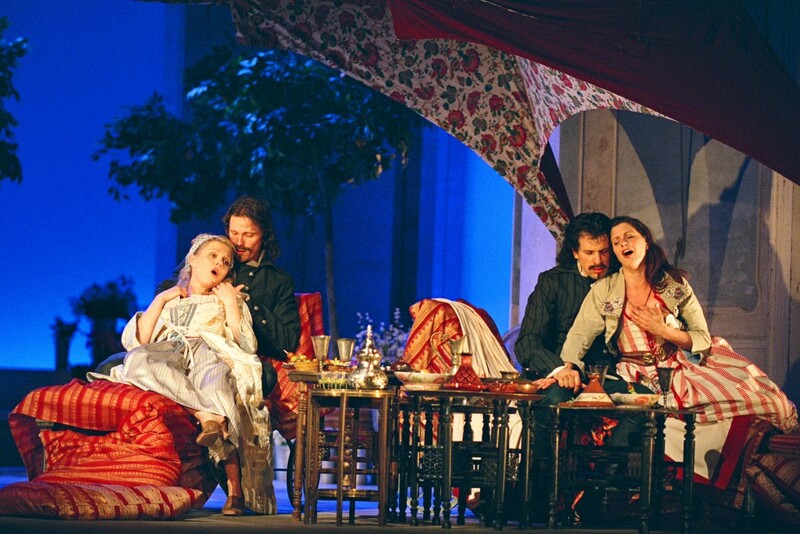 Photo caption: The four young lovers in the Festival 2010 production of Così fan tutte. Photo: Mike Hoban. Director, Nicholas Hytner, an esteemed theatre director, film director, and film producer, is best known for his National Theatre productions including Miss Saigon and The History Boys. Conductor, Leo McFall, was the winner of the Deutsche Dirigentenpreis in 2015 and was also a finalist in the Salzburg Festival/Nestlé Young Conductors Award in 2014. His previous work at Glyndebourne include a Stravinsky double bill in 2010, and the premiere of Julian Philips’s The Yellow Sofa in 2009. The four young lovers will be sung by Ukrainian tenor, Bogdan Volkov (Ferrando), Russian baritone Ilya Kutyukin (Guglielmo), Canadian soprano Kirsten MacKinnon (Fiordiligi) and Irish mezzo-soprano Rachel Kelly (Dorabella), all making their Glyndebourne debuts. Multi-award winning Bogdan Volkov started out as a member of the Young Artists Program of the Bolshoi Theatre and joined the Bolshoi Theatre Opera Company in 2016. Ilya Kutyukin started singing, aged seven, in a local church choir. He was also an artist ­of the Young Artist P­rogram of the Bolshoi­ Theatre and made his debut there as Moralès in Carmen conducted by Tugan Sokhiev. Kirsten MacKinnon graduated as an Alfred Greenberg Memorial Fellow from the Curtis Institute of Music in Philadelphia in 2016. Kirsten has sung Annina in La traviata with Opera Philadelphia and was awarded winner of the Metropolitan Opera National Council Auditions in 2017. 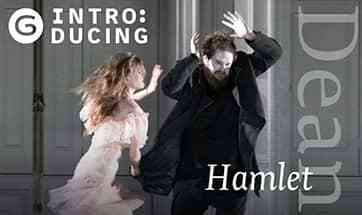 Rachel Kelly is a recent graduate of the Royal Opera House Covent Garden’s Jette Parker Young Artist Programme. Following an impressive performance at Operalia (The World Opera Competition), Kelly was invited to make a special guest appearance alongside Plácido Domingo in concert in Dublin. 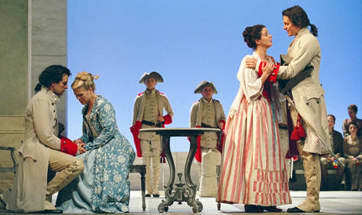 The cast is completed by Portuguese baritone José Fardilha as Don Alfonso, and Portuguese soprano Ana Quintans as Despina. 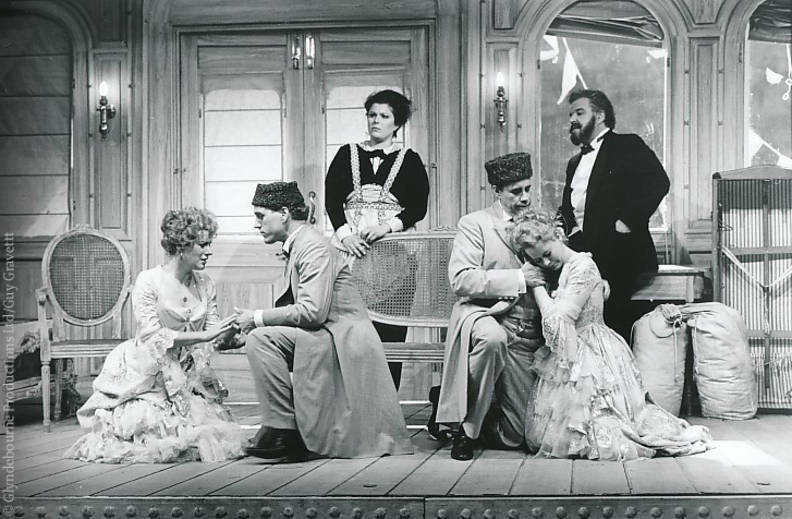 Così fan tutte is the second most performed opera at Glyndebourne (after Le nozze di Figaro) and was first performed at our inaugural Festival in 1934. In 1951 it was also the first non-BBC produced opera to be transmitted on screen. Forty years later, in 1991, a Trevor Nunn production was part of our season commemorating the bicentenary of Mozart’s death. Friday 13 October, 5.30pm. Tickets £5 to ticket holders for that day’s performance. Join us for a bite-sized introduction to the opera.